This entry was posted in Impact In 5 Pictures Or Less, More Things! 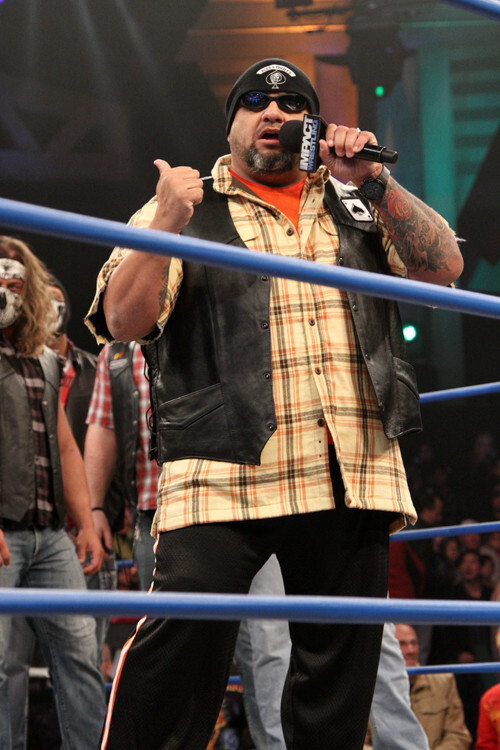 and tagged Dixie Carter, Impact In 5 pictures or less, Tommy Dreamer on June 20, 2014 by Tom B. Every week, @TomBlargh will look at some of the awful merch that someone expects you to buy. Up this week: ECW T-SHIRT SPECIAL. There’s one bit from the Rise and Fall of ECW documentary that always stood out to me. It’s where they’re talking about how they all chipped in and did jobs in addition to wrestling to help out – Stevie Richards would man the ECW hotline, Bubba Ray Dudley would talk to the venues… and Taz would design the shirts. The last one always seemed weird to me. Taz? Really? The guy with all the orange who dresses like this? He was the one responsible for coming up with all the iconic ECW logos and shirts? This warranted further investigation into ECW’s shirt designs (with the ZandigFans forum proving a treasure trove of material). Now, I don’t know if Taz is responsible for all of these but… well, I wouldn’t be surprised. LET’S GET STARTED. They might as well have had the slogan read ‘THIS GUY FUCKED THESE TWO GIRLS / PRETTY COOL HUH’. This entry was posted in The Merch Table and tagged ECW, Taz, The Eliminators, The Merch Table, Tommy Dreamer, Wrestling on Earth on August 14, 2013 by Tom B.